In 2018, the Chinese New Year starts on February 16 and 2018 is the year of the dog. Last year I made a rooster for Chinese New Year. 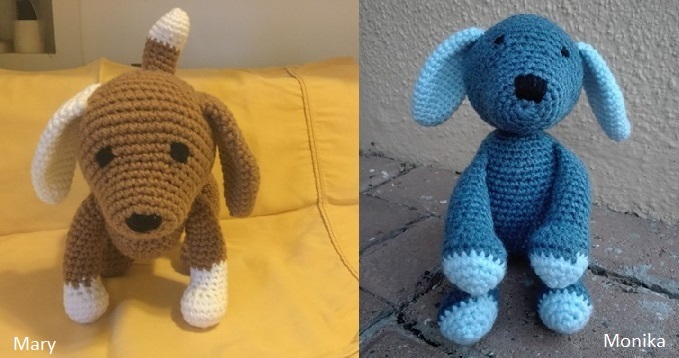 Everyone really seemed to like that pattern, so I figured I’d make it into a tradition, so this year I made a dog! 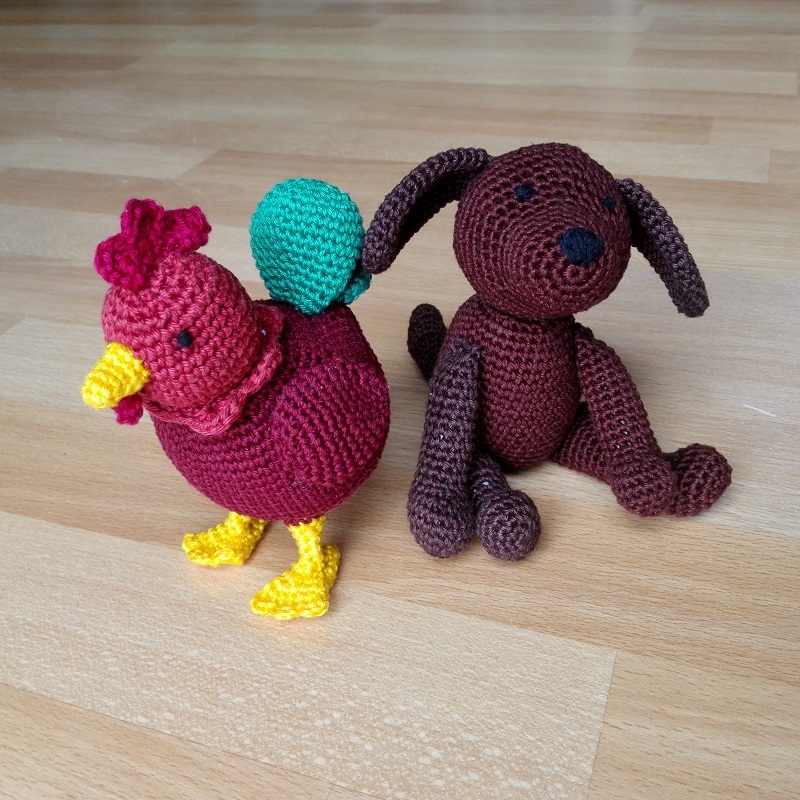 I will also have a CAL (crochet along) on the Facebook page “Learn Amigurumi Crochet With Us”, so be sure to join that group if you want to join the CAL! The CAL starts Monday February 5th so we will finish our dog in time for Chinese New Year! We had a great CAL, many people joined and here is the group picture showing everyones creation! Just like last year, I made two versions, a sitting one and a standing one. They both use the same pattern, but are assembled differently. My sitting dog was 12 cm (4 3/4 inches), the standing dog 14 cm (5 1/2 inches). This dog is crocheted in the round. Using stitch markers or a contrasting color of yarn can help you to count stitches. Of course you can use any yarn, as long as you change the size of your crochet hook accordingly. Here is a post where I explain how to find the right hook size for your yarn. If you use thicker yarn and a bigger hook, you will get a bigger dog. 21. sc5, ch1, turn. Fold the leg so you can crochet through 2 layers at once (here is a video showing how to do this): dec, sc, dec.
21. sc5, ch1, turn. Fold the leg so you can crochet through 2 layers at once: dec, hdc2, dec.
At this point you will have: 1 head, 2 ears, 1 body, 4 legs (2 front, 2 hind) and 1 tail. We will start by embroidering on the eyes and nose on the head. I used this tutorial for that. The eyes are attached 7 stitches apart on row 11. Make sure your head is in the right position when embroiderying on the eyes: the bottom of the snout is flatter than the top (like you can see in the pictures). My nose is 4 stitches in width and 2 in height. The ears are 12 stitches apart in between row 16 and 21. In both row 16 and row 21, they are 12 stitches apart, so they are a bit tilted. For the sitting dog, the head is placed on the pointy end of the body and the “flat side” of the body is the belly. Head: attached to the top of the body where the head is at row 14-18. Back legs: between row 6-10. 9 stitches apart in row 6, 17 stitches apart in row 10. Front legs: between row 19-22. 16 stitches apart in row 19, 11 stitches apart in row 22. For the standing dog, the head is placed on the blunt end of the body (and tail on the pointy side) and the “flat side” of the body is the back of the dog. Head: attached row 14-18 of the head to row 24-22 of the body. Make sure your are placing it on the “flat side” of the dog’s body. Front legs: between row 6-10, 15 stitches apart in both row 6 and 18 stitches apart in row 10. Back legs: between row 19-22, 18 stitches apart in both row 19 and 22. Tail: at the pointy end of the body. I always love seeing what people make with my patterns, so if you share your creation on instagram, be sure to tag me (@WithLoveFeli) so I can see what you made! You can also view this pattern on ravelry. 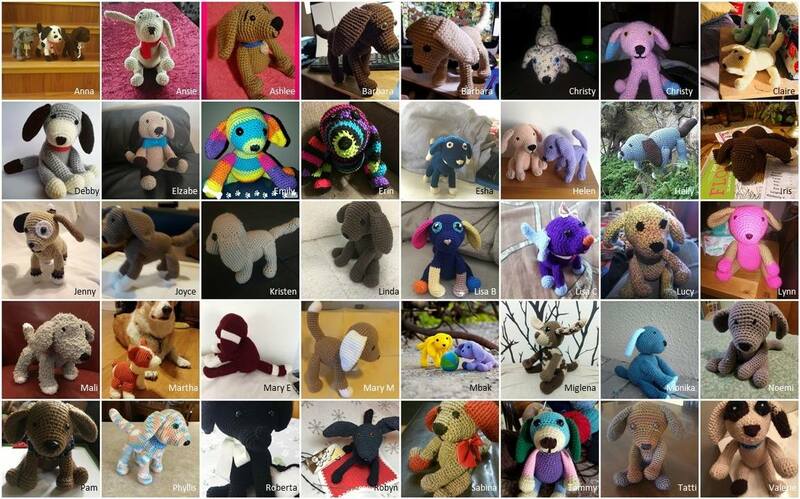 You can also follow me on facebook and youtube, so you can see my new patterns and videos as soon as they come out.